RIO DE JANEIRO, Jun 21 (TerraViva) Chewang Norphel is an unlikely hero. He’s a modest, small, quiet, thoughtful man, who doesn’t check his own image every time he walks by a mirror. A couple of years ago, some of his neighbours even thought that he was crazy. But now, Norphel, an Indian civil engineer working for the department of Rural Development (DRD) of Jammu Kashmir in Ladakh, in the Himalayas, is greeted by the very same people who dismissed him as a benefactor. During his long stint at the DRD, Norphel came to realise that the water flowing from the Himalayan glaciers down the mountains was changing its patterns and had become erratic. In a region where it almost never rains, and where the population depends 100 percent on glacier water to irrigate wheat and vegetable plantations, these new erratic flow patterns were dramatic. In the late 1980s, Norphel designed artificial glaciers on the sides of the mountains near Ladakh, which would be exposed to direct sunlight. Tanks placed just off the rivers’ beds, connected to them by channels, would serve as reservoirs of fresh water during spring and summer, and then freeze during the winter, to release again when needed. At first, neighbours thought the engineers had gone mad. But when spring and summer came, and the reservoirs melted down and provided a sure, steady flow of water for agriculture, Norphel’s genius was finally recognised. Now he is known as “the ice man”, and greeted with gratitude by local farmers. Norphel’s story is one of the most vivid examples of how people are coping with climate change in the Himalayas, and at the same time making sustainable development possible. It is told in the documentary film “Revealed: Himalayan Meltdown”, which was presented June 20 in Rio de Janeiro, as a side event to the U.N. summit on sustainable development, also known as Rio+20. “I’m happy that my idea was accepted by people, and is helping them now,” Norphel says in the film. Human-made climate change and global warming are putting the lives of millions of people in Pakistan, India, Bhutan, Nepal, Bangladesh and China at risk – people who themselves emit almost no greenhouse gases but cannot afford cost-intensive solutions. The impacts of the Himalayan meltdown are multiple. While the wheat fields of Ladakh suffer from erratic glacial water flows in spring and summer, other regions are confronted with the possibility that the meldown may cause a devastating flood. This is the case of a new lake called Thortormi in the kingdom of Bhutan, on the southern slopes of Table Mountain near the border with Tibet. It formed from water flowing down from the melting Thortormi glacier, which until some months ago was held in place only by a moraine dam, made up of rocky debris and mud. Local populations fear that the newborn lake could burst its boundaries, destroy the moraine, and provoke what scientists call glacial lake outburst floods, or GLOF, deadly tsunamis flowing down the mountain. Such a tsunami already happened in 1994, killing at least 21 people and destroying crops and villages. With the financial and technical support of international organisations such as the U.N. Framework Convention on Climate Change (UNFCCC), the U.N. Environment Programme (UNEP), and the Global Environment Facility (GEF), among others, local populations transformed the moraine into a proper dam. To that end, some 350 local people, including women and teenagers, worked under extremely difficult conditions to transport tools, stones, and other construction material up the mountain 5,000 metres above. “Himalayan Meltdown” shows the group working knee-deep in glacial water carrying stones and mud to upgrade the dam. 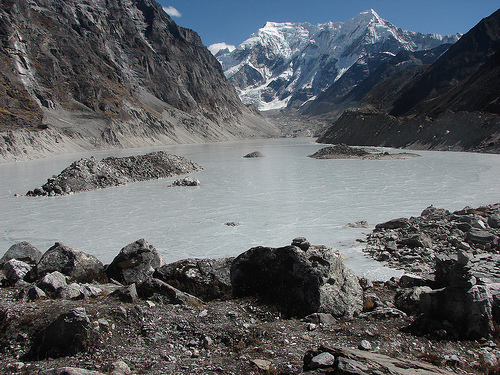 Lake Thortormi is one of the 24 Bhutanese glacial lakes considered unstable. The country has 2,674 such glacial lakes. Rivers for Life, Human Banner, Rio+20 from IPS Inter Press Service on Vimeo. Agroforestería en América Central from IPS Inter Press Service on Vimeo. Terraviva talks to Giuseppe Sala, CEO of EXPO Milano 2015 Expo Milano 2015 is in Rio to kick off its global dialogue on food and energy. During a side on June 21, CEO Giuseppe Sala gives an overview of the Expo 2015 that will run from May to October in Milan, Italy.more >>. Tierramérica conversa con Marcos Apurinã, Coordinador General de COIAB from IPS Inter Press Service on Vimeo. Are you ready to Connect4Climate? World Bank's social media campaign engaged African youth caring about climate change. TerraViva is an independent publication of IPS Inter Press Service news agency. The opinions expressed in TerraViva do not necessarily reflect the editorial views of IPS or the official position of any of its sponsors or partners. Copyright © TERRAVIVA Rio + 20.